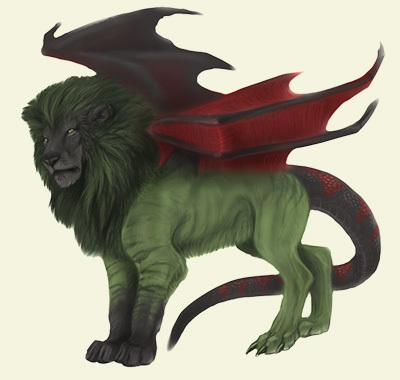 Manticores possess the bodies of huge lions, with bat-like wings that aid their flight. Adding to their already remarkable prowess as hunters, these wings allow manticores to chase prey among the top of trees as well as along the forest floor. Swift and heavily muscled, most of their time is spent on the ground, where they run with wings tightly pressed to their backs, traveling just as fast as they do in flight. Equally content to travel during the day and night, these felines protect their masters intensely, although they don't mind the occasional nap by your bed. Traveling deep in the jungle, you catch a glimpse of an unnaturally large lion. Hiding behind a screen of vines, you watch as this huge feline pads on soft feet to a river for a drink. You stare with amazement as giant, bat-like wings extend from its back and its powerful form bends down to reach the water. Dark and webbed, these bestial wings look capable of carrying the lion in flight, and are quite unlike anything you've seen on a creature from The Keep. How such an animal came to exist, you don't know, but you can't miss the chance to follow this animal in the hope of finding a rare egg to steal away.